On the rugged and majestic Maine coastline, lies the coastal town of Cutler, which is the last protected harbor before reaching Canada's shoreline. Little River Island lies at the entrance of that harbor, not far from the mainland, and is one of the most picturesque, unspoiled waterfronts in the state. It was on this little island that overlooks the Bay of Fundy that Little River Light was erected in 1847. 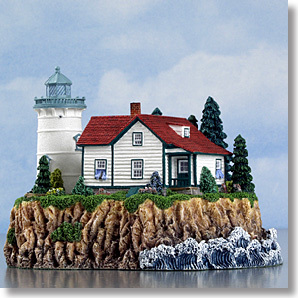 This replica was made by Harbour Lights and depicts the charming setting of the light station. A perfect home decor item, this replica comes packaged in a protective box and is a numbered edition.